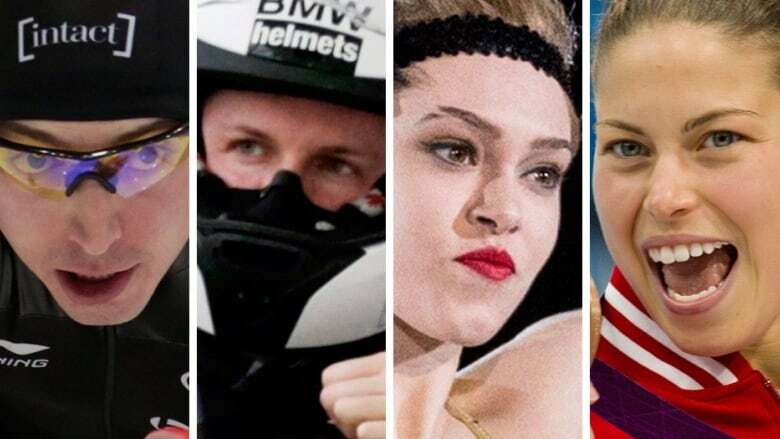 Here's watch to look for on this weekend's Road to the Olympic Games shows featuring sports from around the globe in speed skating, bobsleigh, figure skating and diving. Hosted by veteran broadcasters Scott Russell and Andi Petrillo, Road to the Olympic Games chronicles athletes' journeys on and off the field of play. Here's what to look for on this weekend's show on CBC Television and CBCSports.ca. The fastest men and women on ice take to the oval in Seoul, South Korea for the World Sprint Speed Skating championships this weekend. It's a two-day competition where each of the competitors lines up for two 500m and two 1000m races. Using the Samalog system whereby the totals are converted into 500m units, the skater with the lowest number of points is declared the world sprint champion. Since the inception of the championships in 1970 Canadian men and women have won 10 titles including legends of the sport such as Gaetan Boucher, Jeremy Wotherspoon, Catriona Le May Doan and most recently Christine Nesbitt who won in the Netherlands in 2011. "World sprints are tough to win for sure," said Nesbitt via email from Calgary. "While both races are considered sprints they are different enough that you can be racing one distance well and struggling with the other. I would say it's similar to the 100m and 400m in track. In multi-distance events it is easy to drift off to the final overall result. It has always been one of my favourite competitions to race though, especially when you feel like the underdog – sometimes you can really just fly." Four Canadian skaters will take part in Seoul led by world single distance bronze medalist at 500m Alex Boisvert-Lacroix of Sherbrooke, Que. The favourites on the women's side are two Americans, Brittany Bowe and Heather Richardson-Bergsma, who have won two of the last three sprint championships but they may get a run from home town favourite Lee Sang-hwa who holds the 500m world record. She's coached by Canadian Kevin Crockett and won the championship in 2010. As for the men, few would doubt the chances of defending champion, the "Russian Rocket," Pavel Kulizhnikov who has broken the world record at 500m this season and swept the sprint gold medals at the recent single distance championships at home in Kolomna. All this while world champion in the mass start Ivanie Blondin prepares to leave for next week's world all-around championships in Berlin. Blondin was the top Canadian in the multi-disciplined event last year in Calgary as she finished 6th. But she's making the mass start into her race at it gets set for an Olympic debut in South Korea in 2018. "World champion…I'm not used to that yet," Blondin chuckled from her Ottawa home. "The mass start plays to my competitive spirit. I have limited expectations for the upcoming world all-around championships but bringing home the World Cup title in the mass start the week after is definitely a big priority." To date, Ivanie Blondin is the only Canadian winter sport athlete to have won a world championship title this season. While Kaillie Humphries, the two-time bobsleigh Olympic champion is enjoying another banner season, the Canadian male pilots are still searching for the podium in 2-man competition. They get one last chance at the World Cup final in Konigssee this weekend. Justin Kripps and Chris Spring enter the race ranked 9th and 11th overall respectively. Surprisingly a South Korean, Won Yunjong leads the standings having been on the podium four times this season including a victory in Whistler, BC. That's good news considering he's building to the home Olympics in Pyeongchang which are now less than two years away. Kripps has come close twice in the 2-man posting a couple of fourth place finishes and also stepped onto the podium in 4-man competition for the first time in his career at the controls of the big sled. The comeback season of three-time world champion men's figure skater Patrick Chan continues at the Four Continents championships in Chinese Tapei. Chan is now 25 years old and has struggled with his short program throughout the campaign. He finds himself fifth after the first portion of the competition in Taipei City and well behind the big jumper, 18-year-old Jin Boyang of China. Also in the field are strong Japanese skaters Shoma Uno and Takahito Mura. On the women's side Canada is represented by the new national champion Alaine Chartrand of Brockville, Ont. and 2014 Olympic silver medalist in the team event, Kaetlyn Osmond. Osmond is also returning to competition after a bevy of injuries last year and hoping to regain her form. The favourites heading into this event are U.S. national champion Gracie Gold and last year's world championship silver medalist, 17-year-old Satoko Miyahara of Japan. We continue to tell the story of the important diving test event for the Rio 2016 Olympics this weekend. The world's best have gathered in Brazil to qualify spots for the Games this summer. Jennifer Abel and Pamela Ware of Canada have already captured a silver medal in the 3 metre synchro event and now set their sights on podium finishes in the individual springboard competition. Abel is prepping for her third Olympic appearance having competed in Beijing in 2008 as a 16-year-old and going on to win synchro bronze at London 2012 with the now retired Emilie Heymans. "What has always impressed me about Jennifer is her poise," said CBC diving analyst and 2004 Olympic bronze medalist Blythe Hartley from Calgary. "She is the strongest and most powerful diver in the competition and has continued to refine her diving over time. The sheer quality of her diving makes her dangerous every time she enters an event." We'll also be focussing on Roseline Filion as she attempts to qualify another Canadian spot at the Olympics in the women's 10m individual platform. Filion has returned to competition just two months after fracturing an ankle in a dry-land training mishap in Saskatchewan in December. She must qualify to the final 18 in Rio at this test event in order to make the grade. She'll be bolstered by the presence of another Canadian, Celina Toth, in the strong international field. "This is a very courageous attempt," said Hartley of Filion's quest. "Rosie is not obviously the most talented diver on the Canadian team. But her grit, resiliency, and determination are second to none and usually get her where she wants to go."